Open AppStore in your mobile device, search for Larix Broadcaster and proceed with installing it. Or just use this direct link. Now let's proceed to Nimble Streamer setup. Log in to WMSPanel and go to "Nimble Streamer" -> "Live stream settings" menu. Check the HLS and RTMP checkboxes in "General" tab and then press the "Save" button. You may specify Push login and Push password to protect you connection with mobile device. This login and password will be used in Larix Broadcaster settings. Specify the port number in appeared dialog. Also, this port number will be used in Larix Broadcaster settings. Select your Nimble Streamer instance and press the "Save" button. In order to make your outgoing stream be available for RTMP playback, add RTMP port as well. That is usually 1935. Being in Larix Broadcaster application on your mobile device, tap on "Settings..." button. Select the "Connection #0, URI" on the opened Settings page. For SRT streaming setup, check this article. Now return to mobile application preview screen. Make sure that your mobile device has network connection and press "Broadcast" button. Now get back to WMSPanel. Go to "Nimble Streamer" -> "Live streams" menu and click on the number under the "Outgoing streams" column. The video playback from mobile device starts automatically in the appeared dialog. By default the most popular streaming protocol (HLS) is used for video playback. HLS is supported by the most modern mobile devices. If you need to playback video with minimum possible latency, you may use RTMP protocol. To configure minimum latency please read the "Nimble Streamer performance tuning" article. 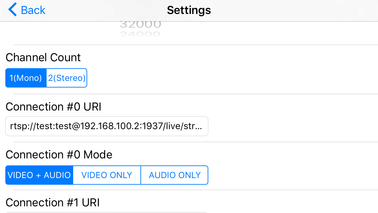 You can now broadcast live video and/or audio from your iPhone and iPad via Larix Broadcaster to your web page, YouTube live or any other CDN. If you'd like to create similar iOS app capable of media streaming, you can use our mobile broadcasting library and SDK which is the core of Larix Broadcaster. You will get Larix source code and a library for further UI customization. Some frequent questions regarding Larix Broadcaster ap and SDK are answered in our FAQ. Hey! What to write on a Larix Broadcaster URL line on YouTube? why this url address does not work in Larix Broadcast? Is it possible not to use a stream server when I want a single client acessing Larix Broadcaster App using rtmp on iOs? How I should setup the app? Unfortunately not, Larix sends streams in publishing mode which doesn't allow connecting to the source device.